CSR project, designed by Meeting Incentive Experts, planners and suppliers donated dozens of books and supplies to Leonardo Gastelum Villalobos educational institution in Cabo San Lucas. During the Donation Ceremony, Meetings Today’s Victoria DeSilvio and Lynne Richardson pose with officials from Meeting Incentive Experts and Leonardo Gastelum Villalobos school principals and students after their special performance honoring Dia de Los Muertos. Meetings Today and Meeting Incentive Experts received a warm welcome from the students, teachers and principals of Leonardo Gastelum Villalobos educational institution for the Donation Ceremony. Puerto Vallarta elementary school called Escuela Miguel Hidalgo y Costilla which is located in the state of Jalisco, located within Puerto Vallarta, in the neighborhood of Coapinole received 410 backpacks and more than $1,000.00 USD worth of school supplies donated by GFS and MIE. Many schools are in need of supplies and assistance due to the government in Mexico only supplying text books for the students and teachers. MIE has helped hundreds of clients help thousands of children in Mexico receive better education with thousands of backpacks for students, school supplies, library set ups and books. Thank you GFS for having a big heart and always giving back to the community! Meeting Incentive Experts in partnership with Society for Incentive Travel Excellence (SITE) and 23 Classic participants, donated 1,500 backpacks with school supplies to all students of Leonardo Gastelum Elementary school (750 attend the morning session and 750 attend the afternoon session). The faculty are trying to make the school a place of refuge where children feel proud and can further their education. Due to the lack of government services, the teachers do not receive funding to support supplies, technology, cleaning, storage, extracurricular activities, etc. The children attending Leonardo Gastelum Elementary school are from lower, working class families such as maids, taxi cab drivers, construction workers and gardeners. “There is great importance of supporting these children with limited resources so they can fulfill their dreams as they are the future ambassadors of the destination” Ms. Nemeth said. The school was selected due to the increase in classroom size and need of the community, which, was greatly affected by Tropical Storm Lidia 2 weeks prior. Every year Gordon Food Service supports a local community in Mexico during their annual Incentive Program. In January, 2015, the donation was in Los Cabos where a local school in San Jose del Cabo received more than two thousand dollars ($2,000.00 USD) in books. 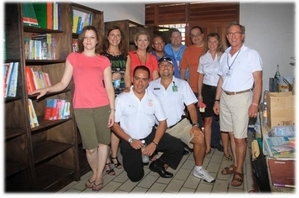 On September 14, 2014 hurricane Odile caused great impact on the school’s library and Gordon Food Service, with the assistance of Meeting Incentive Experts, created the idea to provide new English books to the students. In addition, the individual participants elected to bring school supplies from their homes in Canada to further assist the CSR program. Gordon Food Service held a breakfast meeting at their hotel prior to delivering the books and the supplies to the school where the school principal gave an emotional speech, showing before and after videos of hurricane Odile and expressed many needs that still need to be addressed. Upon the arriving to the school, the participants were welcomed by the students and their parents with music and posters made by the children expressing thanks to Gordon Food Service. Because of this generous donation, the students of Institute International Libertad and future generations will have the possibility to continue learning English. Thank you Gordon Food Service. Corporate Social Responsibility has become a top priority for many corporations conducting Meetings and Incentives in Cancun, Mexico. Gordon Food Service (GFS) has consistently supported Mexico throughout various destinations (Cancun, Los Cabos and Puerto Vallarta) by incorporating a CSR program within their group itinerary. The fortunate students of Raze de Bronze school recently received a library with over 850 books in addition to playground equipment from GFS. Hundreds of students from Raza de Bronze received GFS executives with a welcome ceremony including thank you banners and performances of traditional Mexican songs and dances. Thank you Heather Connelly and GFS! Family Video again supports the local Cancun community by supplying Rio Hondo school with an entire playground and basketball court that the school did not have. This promoted not only additional interaction amongst the students, but health and activity for the entire school. In addition, participants that attended the Family Video program donated school and art supplies, sports equipment and uniforms to the school. Meeting Incentive Experts and Family Video additional contributed to finalize the playground landscaping by adding gravel around the playground structures. This CSR program was the 3rd time that Family Video and Meeting Incentive Experts partnered together to give back to the local community. Thank you Heather Hanrahan and Family Video! On August 15, 2014, Cintas Corporation donated backpacks filled with school supplies to 850 students at the Raza de Bronce elementary school in Cancun, Mexico with support from GMR Marketing (GMR) and the Cancun destination management company, Meeting Incentive Experts (MIE). This social responsibility initiative is part of the annual Cintas President’s Club program, an incentive program for Cintas sales employee-partners produced by GMR in partnership with Cintas since 2009. Cintas introduced this social responsibility initiative to the reward trip last year when by donating 500 backpacks filled with school supplies to the students of a local elementary school in Playa del Carmen, Mexico. Inspired by the success of last year’s initiative and the emotional outpouring from the students and their families, Cintas was compelled to expand the program by lending support to another area school this year. When this year’s beneficiary school, Raza de Bronce, was identified to have over 800 students, Cintas did not hesitate to nearly double their efforts from the previous year to provide backpacks and supplies to the entire student body. While education in Mexico is government funded, the funding is not adequate to cover all of a school’s needs. Often this burden falls to the students’ parents, who most often are not in a financial position to take on the burden. Cintas’ donation of school supplies relieves some of that burden and helps promote pride in education in the young students of Mexico. In addition to the school supplies, Cintas donated sports equipment including a dozen each of volley balls, soccer balls and basketballs along with soccer goals. MIE and GMR were also inspired to participate in the philanthropy. They, along with Cintas, donated funds to purchase multiple truckloads of gravel to refurbish the school yard and they hired cleaning and plumbing crews to restore the school’s neglected restrooms to full working order. Lastly, MIE donated popsicles to the students helping to keep the children cool on a very warm August day. The Raza de Bronce school in Cancun was very fortunate to have GFS and MIE invest in social responsibility to their alumni, which will encourage student retention and support the family economics in Cancun public schools through the delivery of much needed school supplies. This social responsibility strategy will promote equity education in the state of Quintana Roo, having substantial effects on learning and student development. RAZA DE BRONCE was founded in 2004 as an elementary school with only operation in the afternoon. Currently, the school has grades 1-6 with 407 student’s ages 6-12 registered for the 2013-2014 school year. cooperation and resources of the parents to provide food, school supplies, backpacks and uniforms to students. Research findings indicated that most of the differences in student learning and graduation are due to socioeconomic factors. This generous program which GFS helped fund and large donation scope will teach the value of giving to those in need while promoting educational achievement and success. Adam Lawhorne, CEO (CITE) of Meeting Incentive Experts, and Heather Connelly, Marketing Manager for GFS Canada, (Gordon Food Service) organized a Humanitarian program in Cancun Mexico at the Fiesta Americana Condesa Cancun All Inclusive. Participating school children attend the Raza de Bronce School in Cancun. GFS Canada division donated 77 pairs of shoes and presented over 40 children with school materials and toothbrushes during there 2011 attendance of the Winners Circle Incentive program in Cancun Mexico. The children were transferred (courtesy of Meeting Incentive Experts) from their school to the resort via a deluxe motor coach. Upon arrival, they were greeted with a standing ovation of applause and then seated in a unique Mayan venue. Breakfast was served for the children and attendees of GFS (hosted by the Fiesta Americana Condesa Cancun All Inclusive resort). Gabriel Florero, Manager of MIE Cancun, and Jose Caballero coordinated the logistics with the Secretary of Education in Cancun for the school selection while Meeting Incentive Experts took care of the request to over 100 attendees to donate a pair of shoes for the 3rd and 4th grade students. Attendees and children were pre-matched for distribution. Thank you GFS Canada for all of your support! Adam Lawhorne organized Humanitarian program in Los Cabos Mexico with Hospital Especialidades in Los Cabos with well-known Dr Ken Stein plastic surgeon from Chicago. Dr Stein has donated his time for surgery to assist Los Cabos Mexico during October and November at the hospital Especialidades. Dr Stein has had provided his assistance in Guatemala and Asia and is committed to assisting countries in need of plastic surgeries. Dr Kenneth Stein is a partner of Meeting Incentive Experts and looks forward to assisting The Society of Incentive Travel Executives with Humanitarian projects in the near future. Promotional assistance has been provided by: The Sheraton Hacienda Del Mar Los Cabos and The Melia San Lucas and Cabo Mil Radio, Logistics and Air transportation provided by Meeting Incentive Experts.